Mr Tomlin was 32 when he died after being pinned down and arrested by officers in Haywards Heath in July 2014. 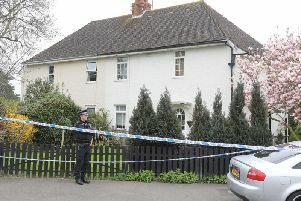 Over the last four weeks a jury inquest has been taking place at Centenary House in Crawley to try and establish how he died. This morning the last piece of evidence was heard and assistant coroner Elizabeth Bussey-Jones began her summing up of the case for the jury. She said: “You must set aside feeling and sympathy for anyone involved in this inquest. One final piece of evidence was heard this morning, in which Ms Bussey-Jones said that all parties had agreed that Tasers were not used in the incident. Ms Bussey-Jones then began the process of recapping each piece of evidence and witness account for the jury. Paul Tomlin, Mr Tomlin’s father, was summarised as saying that son’s seizures were ‘not what one imagines’: “It is not just falling into the street and kicking out, it varies. Jack Fulger, who had been drinking with Mr Tomlin and others on the night he died, had described how he started acting ‘weirdly’ after taking cannabis. He was summarised as saying: “Duncan was sort of breathing really heavily. The jury heard Mr Fulger’s recollections that Mr Tomlin had been threatening to kill the people in the house and was screaming. A neighbour heard ‘a lot of thumping as if somebody is being pinned up against the wall’ and called the police, the inquest was told. She described seeing a man push Duncan out of the house and close the door. The evidence of PC Watson – the first officer involved in the restraining of Mr Tomlin – was also summarised. The inquest heard that he and others were at Haywards Heath Police Station when they were called to a ‘disturbance’ in Wood Ride. When he got there he saw Mr Tomlin running away and gave chase. The inquest heard that PC Watson did not think Mr Duncan was having a seizure, rather that he thought he was on drugs due to the ‘immense strength’ he had. He denied that he failed to explore the ‘seizure issue’ with Anne-Marie Botting, Mr Tomlin’s girlfriend. “I don’t accept that I failed to tell Police Sergeant Glasspool relevant information. Off-duty detective David Shabazi – who went over to assist the officers restraining Mr Tomlin – said Mr Tomlin displayed ‘extreme strength’. The inquest heard that he advised the other officers that Mr Tomlin needed to be sat up. “It was a difficult situation. I did say it to them but they did not respond and I did not reinforce it. Ms Anderson said she saw officers pinning Mr Tomlin on the ground while they waited for a police van to arrive. Another neighbour, Storm Croydon, said she saw the van stop at one point after it set off. Assistant coroner Ms Bussey-Jones is expected to finish summing up the evidence tomorrow, after which the jury will be sent out.